IntelliServe is constantly being updated to bring our users, and your clients, the most bang for your buck! Visit this page regularly to learn about the improvements and new features we're regularly releasing. You've always been able to send statements to clients, but as your client list grew, it became more tedious every month! So, we have made changes that will make month end a breeze! This is a really simple way to send statements and will save you LOADS of time! Statements only reflect invoices, payments & credit notes for the past 90 days, and anything older than 90 days is the opening balance. Step two: click Send Statement button at the top of the client list! This is an improvement on the original way of sending statements, but now the system only sends for the past 90 days, with an opening balance carried forward from older transactions. We all have clients who ask "Why do you send me an invoice for every job card in the same month? Please just send me ONE INVOICE"
So we have great news for you AND your clients: You can now select multiple job cards for the same client, and convert them all into one invoice. The invoice will reflect all the items from all the job cards, and also references each of the job card numbers. AND THERE'S MORE: You can now convert multiple job cards to a single Purchase Order, and a single Picking Slip! You already know that your IntelliServe Mobile App has a navigate function to assist your technicians to make their way to your clients. We realised we needed to let you see exactly where each client or breakdown is located, so you now see a Map when you are capturing an address. Once you've saved the address, IntelliServe geocodes the location, and then you can name the location, and save and close. Why is Geocoding Important? It will improve the accuracy of the location in the job card, making sure your technician or service goes to EXACTLY where they are needed. No more missed work and income due to lost drivers or non-existent locations. Smarter, Faster, Better Value for Money. By now you've realised that IntelliServe just keeps improving month after month! By staying in close contact with our clients, and developing an in-depth understanding of each of your unique operations and requirements, we're able to work in new features and improved workflow ideas that are based on real data and intel! So what's new or improved? The past month has seen really impressive fixes and new features released into your most trusted job card and work flow application! Inventory movement records can now be printed or emailed as a picking slip - a great new feature that ensures there is always a record for stock or equipment being assigned and moved! 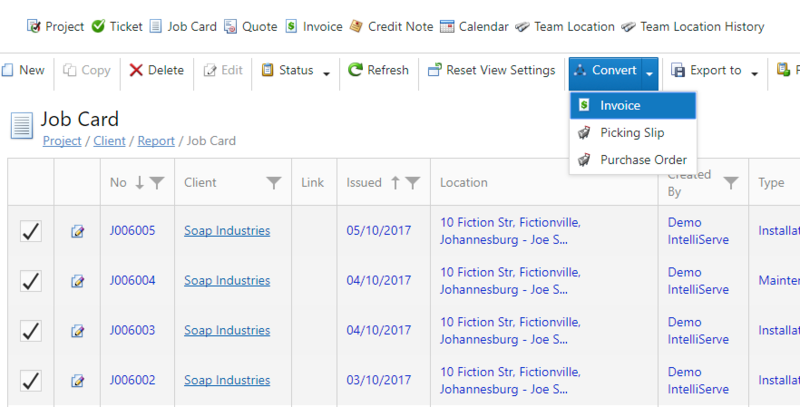 You can now also create a picking slip from directly within a job card - saving time and minimizing the risk of stock being collected haphazardly as a job progresses. Purchase orders can now be marked as delivered with the click of a button, all you need to do is edit the items on the purchase order to show which was delivered and in what quantities, and IntelliServe will do the rest! You can now also create a purchase order from within an invoice. Being able to see stock levels of each item while building a job card or quote means you will also enjoy a reduced incidences of your teams committing to a job, only to find out at a later stage that stock is not available. It is now possible to identify a client type when creating or updating a client. This is useful in determining whether a client is a Cash Only client, or whether they are on a particular Service Level Agreement etc. Another useful feature which you may have noticed is a field called Label. You can now build your own drop-down list of useful labels for job cards. These could be based on a particular type of service, or a product line etc. Its really up to you to determine what this could be used for. To build your list of labels, go to the 'Lookups' tab and select Labels. CREATE NEW CLIENTS ON THE FLY! Navigating to a job site using the IntelliServe app has been availble for some time. But now, it's been given a major boost with the added option of opening your Uber App when you want to navigate to your job. We are able to produce custom reports, job cards, quotes and invoices to better match your corporate brand and image. We are also offering reduced rates on training until 30 September 2017. Please write to support@intelliserve.co.za to be put in touch with a local reseller or agent.